Repsol Honda’s Marc Marquez took his first-ever MotoGP win at Twin Ring Motegi on Honda’s home asphalt, securing the 2016 MotoGP title. 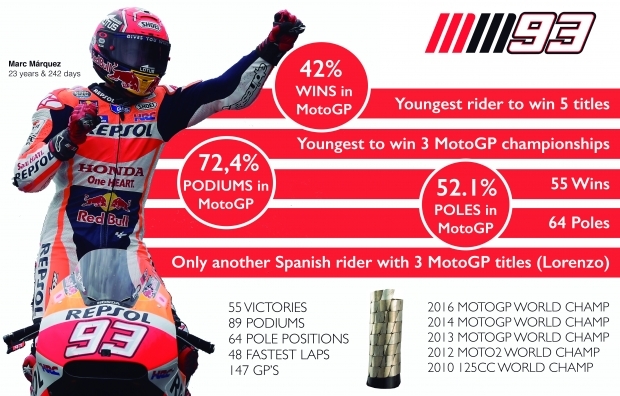 At 23-years old, Marquez is now the youngest ever rider to win three premier-class World Championship titles and five World Championships over all classes during a period of only nine years of World Championship racing. Marquez has now equalled Mick Doohan, Jorge Lorenzo and Toni Mang’s tally of 5 World Titles in his career. – Marquez is the youngest-ever rider to win three premier-class World Championship titles, at the age of 23 years 242 days, taking the record from Mike Hailwood who was 24 years 108 days when he won his third successive 500cc title in 1964. – Marquez is also the youngest rider of all-time to reach the milestone of five world championship titles, taking the record from Valentino Rossi who was 24 years 238 days old when he won his fifth title – the 2003 MotoGP championship. 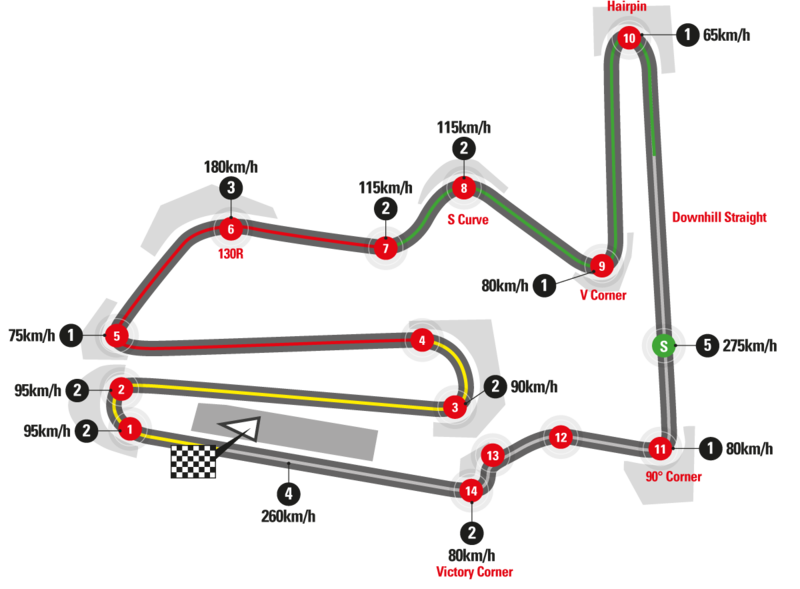 – Marquez won all his three MotoGP Titles riding for Honda, equalling the number of premier-class title achieved by Valentino Rossi when riding for Honda (1 x500cc + 2 x MotoGP). The only rider who has won more premier-class world title riding for Honda is Mick Doohan who won the 500cc title on five occasions. 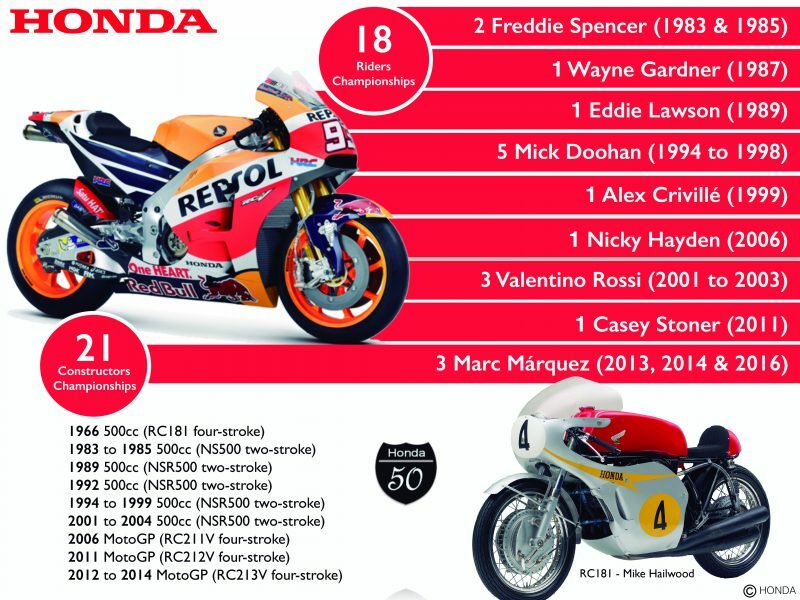 – There is only another Spanish rider with more World Titles than Marquez and Lorenzo: Angel Nieto with thirteen world championship titles (7 x 125cc, 6 x 50cc). – With his win in Japan Marquez has won a Grand Prix at least five times per season for the last seven years (across the various GP classes), something achieved previously by only two riders in the 68-year history of motorcycle grand prix racing: Giacomo Agostini and Mike Hailwood. 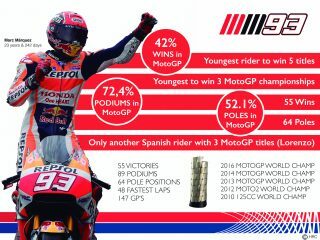 – During 2016 Marquez has had more wins than any other rider in the MotoGP class (five), most podiums (eleven) and most pole positions (six).